With the beautiful spring weather, I’ve found that my little ones have a new joy and excitement in their day as well as a new level of exhaustion at the end of the night. It’s funny how many times as a mom I look at my children and see so much of myself as a youngster. I remember many summer days playing outside until I was completely worn out. I would fall into bed at night with nothing but aching legs and wonderful memories. I also find it's practically impossible to think back to my childhood without thoughts of my mom coming to mind. Whether it was being checked on in the middle of the night when sick, cooking together in the kitchen, or collecting insects from the creek to examine together under the microscope, my mom was always there. Funny how growing up she was always just “Mom” but suddenly with children myself I’ve realized the constant, self-sacrificing blessing she has always been in my life. You see, my mom and I had a very unique relationship growing up since my siblings and I were homeschooled from kindergarten through ninth grade. As a mom now, I’m learning that teaching a child is no easy task. Looking back I can see that the road that my mom chose as a homeschooling mom (back before it was a common and accepted thing to do) was not an easy one. She didn’t get a break from us. She lived day and night with us and for us. From the time we got up to the time we were tucked into bed, she was teaching us everything from spelling and science to sewing and how to make cookies. She was excited about learning because she loved learning herself. She was not a Dr. of Education, but she had passion and she knew her kids; how we learned, where we struggled, and she had the humility to try something new when her first idea didn’t work. We learned our times tables by running up and down the stairs, and the names of countries to songs. We read through books of the Bible and memorized poetry together. My mom was a phenomenal teacher and I don’t say that because she is my mom, but rather her track record of success with each of us gives her all the credibility she needs. But her teaching went so far beyond scholastics. So many of the things my mom taught me weren’t found in textbooks. It was seeing her reaching out to her neighbors, inviting them to church or making meals for new moms. She is a woman of prayer and her Bible not to mention, a devoted wife. I got to see her daily support my dad, love him and enjoy raising us brood of kids together. Suddenly I find myself doing things in our own family, not because someone told me, but because they were modeled to me my entire childhood. Living for God was not a Sunday morning affair for my mom (and dad too), but a day-in-day-out lifestyle that I saw throughout all my years at home. Showing us the loving ways of our Lord is a responsibility that my mom took very seriously. Now if it seems to you that I’ve painted a picture of butterflies and rainbows, please don’t get me wrong, my mom and I haven’t always had a perfect relationship. In all honestly, the exact opposite is probably true. Living so much in each other’s lives isn’t a cozy “mom is my best friend” kind of a life. 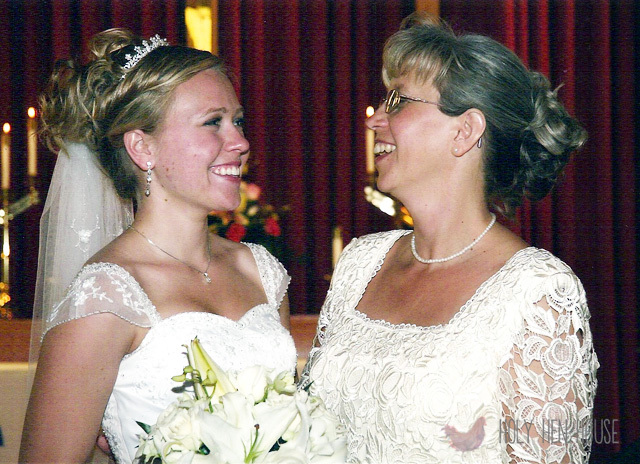 I remember many arguments, tears and difficult seasons in my life between my mom and I. But I don’t think that was necessarily a bad thing. Yes we had our bad days, but now looking back I can see that in so many ways my mom was a beautiful example of how God teaches us, His children. Our relationship with God is not always cozy, feel good moments. It's raw, it's real and sometimes it's actually quite uncomfortable. Because God knows us better than anyone, He doesn't always give us the easy way out. He challenges us and gently leads us in the right way. He disciplines us when we go completely off track and he ALWAYS lovingly works in our lives each day without ceasing. Yes, my mom is still my teacher in so many different ways. However, the most important thing she ever taught me is to trust the ultimate Teacher. To look to Him for every answer, to wait for His guidance, to seek His approval and to live each day giving our absolute best for Him. I pray daily that God gives me the strength, endurance and faith to instill this same lesson in my own children not just today or tomorrow, but for all the years to come. "May you trust Him till the end."